where did you get your metric dimensions? did you measure or did you find a source for them? I meant that i simply convert inches to metric mm. And if you convert straight off you get like 2.0007864mm then you can question yourself, why did Mazda use 2.0007864mm and not 2mm? Most likely Mazda used 2mm. Saxy, you are the ****** man. ohh yeah i agree but its not like our rotors are going into production or any thing :P.
So, where could I find a housing model to fiddle with? I've modeled a rotor for the sake of playing around, but don't have the mad skills to get it all right. Did anyone host their files somewhere? Pro/E, Solidworks, and Solid Edge are all good options for me. yeah but alot of times when you import into solidworks or any other cad program for that matter from another one things tend to get pretty messed up or not work the way they were intended originally. I am new to the rx7club. My reason for joining....I am tired of the high cost of gas. So, on my own I have deceided to develop an engine that will not use gas. It is a combined stirling-wankel-kelvin. To get this done I need a 3d model of the rotary engine. I use ProE Wildfire 2 and can use iges, dxf, or step files. Does anybody out there want to help? Short of this my next action is to go to a repair shop and take my own measurements. Your contribution will help to solve this issue. jreynish it would be greatly appreciated if i could get any rotary engine solid edge files from you. i will not rip of your parts. i have posted solid edge parts before on another blog and someone has riped of my ideas so i know how mutch of a pain in the *** it is . here is my email i have to break my email up so i can send it my email has no spaces or capitals. 1: YES, I AM MORE THAN HAPPY TO GIVE THE MODEL AWAY. Just message me with an address. i would prefer that you just give me credit :p i love to see it popping up in random places. 3: If you need help in any way with making your own feel free to message me i will try to help you as i can. I am still embarrassed over my choice of features to draw the model. 3D curves, wtf? New user here. Im currently a Mech Engineering student in my third year here at University of Rhode Island. I was assigned a project to create a motion study in solidworks for my CAD design clas. I am trying to create a motion study of the 13b engine with as close to accurate dimensions as I can. I have been following the dimensions in this thread closely and have hit a few snags on the spacing of the gear teeth on both the external (rotor) and internal (stationary) gears. I read on one of the linked threads that there are 51 teeth on the rotor gear and it only has a 2/3 rotation for every e-shaft rotation? How is this possible, wouldnt that mean the e-shaft would not be pressed to the 80mm cavity of the rotor? Any help or part files that you have that I can look at to dimension would be really helpful. Also, can anyone tell me how many teeth are on the stationary gear? It's obvious some function of the 51 teeth of the internal rotor gear. I think i actually understand the motion now and im sorry for the stupid question about the eshaft revolution. I forgot that a similar principle applies to a piston engine in that the force transmitted to the eshaft via linear force of pushing the lobe and not through direct torsion of the shaft as if it was connected firmly. The rotation would then be three rotations of the eshaft per combustion revolution of the of the rotor. 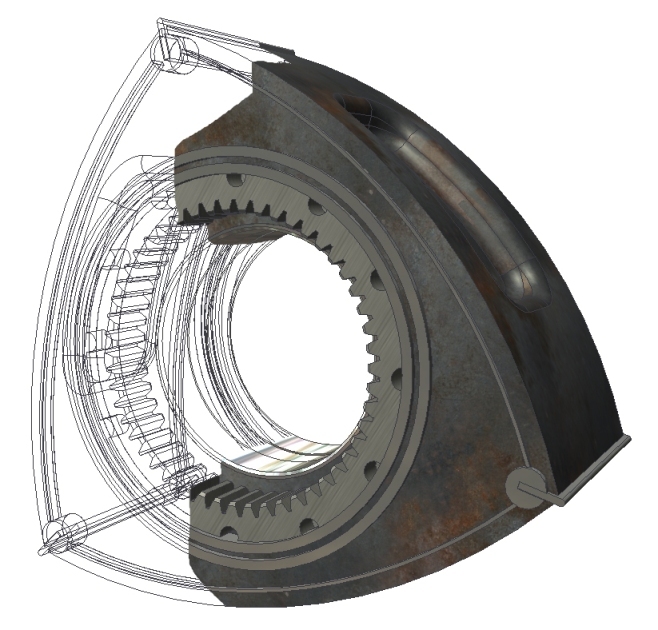 Hi Kenku, I am doing a 2 year Diploma in Mechanical Engineering and I would like to design the rotary engine in solidworks but I don't want to just copy what was posted. I don't understand the equation and how it helps in designing the engine. Can you explain the equation or post a link to a video explaining it and do you know where I can get the dimensions or the engine? Last edited by Philip Knights; 01-10-18 at 08:33 PM. Go to foxed.ca , click on the link that says RX-7 MANUALS and at the bottom of that page you can download Kenichi Yamamoto's book Rotary Engine. For the 1981 edition, pages 11-13 give the equations for the peritrochoid starting with the definition of the variables that make it. Last time I used Solidworks was a few years ago, I remember being able to draw a line from an equation but wasn't able to grab a dimension off it. If you guys want something to fiddle with, https://grabcad.com/library/mazda-13...y-shortblock-1 is fairly accurate. Not perfect, lacks a bunch of internal details here and there, but enough to get started. Flirting with going high-comp on my turbo motor. Experiences?